Amazon has a delivery drone test site in British Columbia, Canada. Amazon takes to foreign skies. 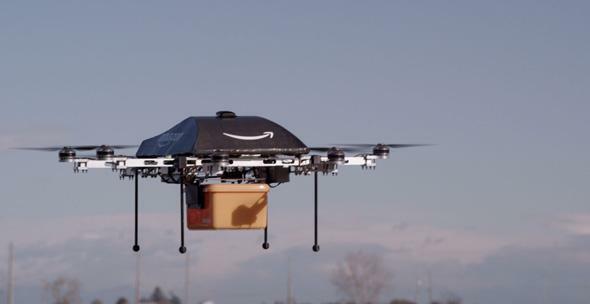 Amazon has been vocal about its frustration with current FAA restrictions on commercial drones. Now, true to its word, the company has taken its drone research out of the United States and is currently conducting delivery drone tests in Canada. The Guardian visited the company’s drone range at an undisclosed location in British Columbia, 2,000 feet from the U.S. border. The company wants to use airspace above 200 feet and below 500 feet as a neutral zone for drones. This height range is above most buildings but below planes and helicopters. The Guardian reports that Amazon’s drones would weigh less than 55 pounds and carry 5-pound or lighter loads (no lawn chair deliveries yet). The plan is for the drones to fly at 50 miles per hour. Amazon’s drone visionaries are taking the permissive culture on the Canadian side of the border and using it to fine-tune the essential features of what they hope will become a successful delivery-by-drone system. The Guardian witnessed tests of a hybrid drone that can take off and land vertically as well as fly horizontally. In December, Amazon’s vice president of global public policy Paul Misener wrote to the FAA, “Without the ability to test outdoors in the United States soon, we will have no choice but to divert even more of our [drone] research and development resources abroad.” Welp, here it is. Other companies could easily do the same thing, or may have already.